After the FIFA World Cup, the most iconic piece of Russian headwear is now the 'kokoshnik,' replacing the 'ushanka' ear-flapped hat, which thanks to the movie 'Armageddon' came to symbolize the popular stereotype of the inebriated Russian. Let’s unpick the story behind the 'kokoshnik,' and discover how patriotic pride brought this folk accessory back in vogue. 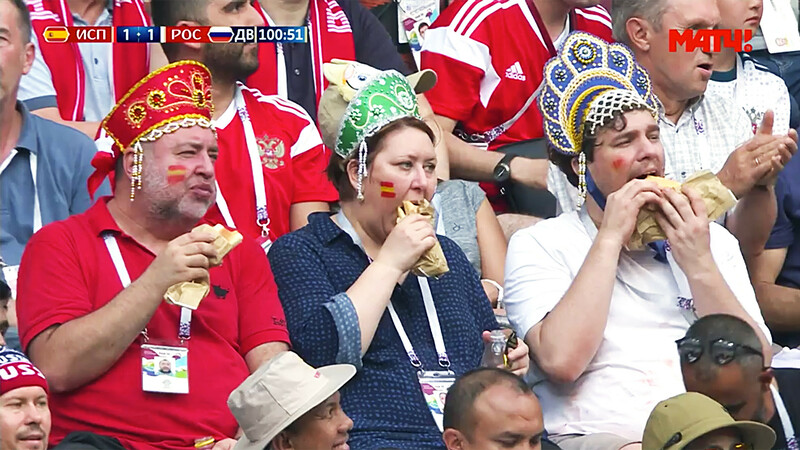 We all saw the now meme-ified photo: two men and a woman munching hot dogs in the 120th minute of the grueling Russia-Spain match. Netizens immediately said that they were not wearing kokoshniks, but crowns, i.e. headwear that doesn’t cover the hair, but simply frames the head. Have you seen a photo of Kate Middleton at the baptism of newborn Louis? Her headpiece can also be described as a crown. Anyway, the crucial difference is that a kokoshnik has a high crest like a rooster's tail (in Old Russia, chickens were called “kokoshes”). Married women in Old Russia (a.k.a. Rus) were obliged to cover their heads and conceal their hair. A piece of fabric was sewn onto the crest of the kokoshnik, which covered the head, and sometimes the neck. It was generally possible to determine a woman’s status by her hair and headdress. A long braid meant that a girl was marriageable. If nature had not been kind, girls would weave horse hair into their own in an effort to show that they were healthy and capable of bearing many children. Married women, meanwhile, used to plait their hair into two braids and tie them around their head. Kokoshniks were often lined with expensive cloth, pearls, and beads, making them very expensive. They were carefully looked after and only worn a few times a year on major occasions. Kokoskniki were family heirlooms handed down from generation to generation. 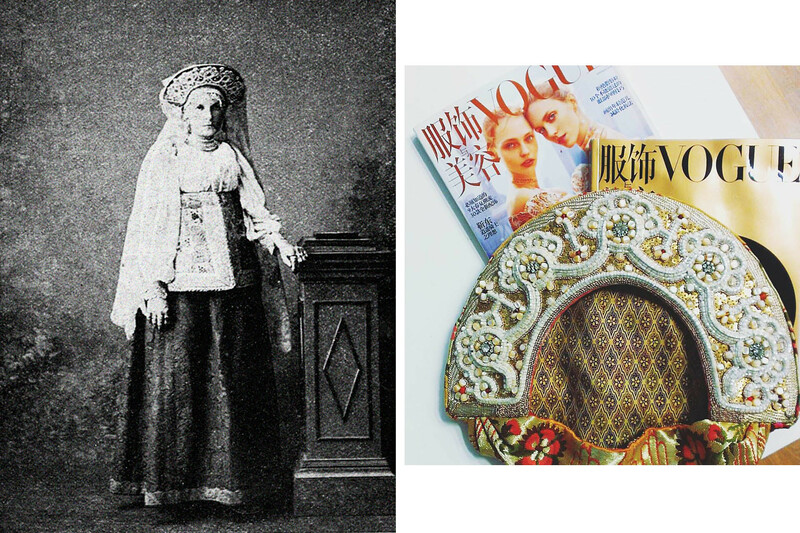 In everyday life, women wore povoyniki – soft hats with a shawl tied around to conceal the hair. The most famous is the pointed or “one-horned” kokoshnik, with a prominent high crest in the form of a triangle or crescent. There were also cylindrical kokoshniki with a flat round base, plus saddle-shaped ones similar to helmets. Almost every region in Russia had its own local flavors of kokoshnik. 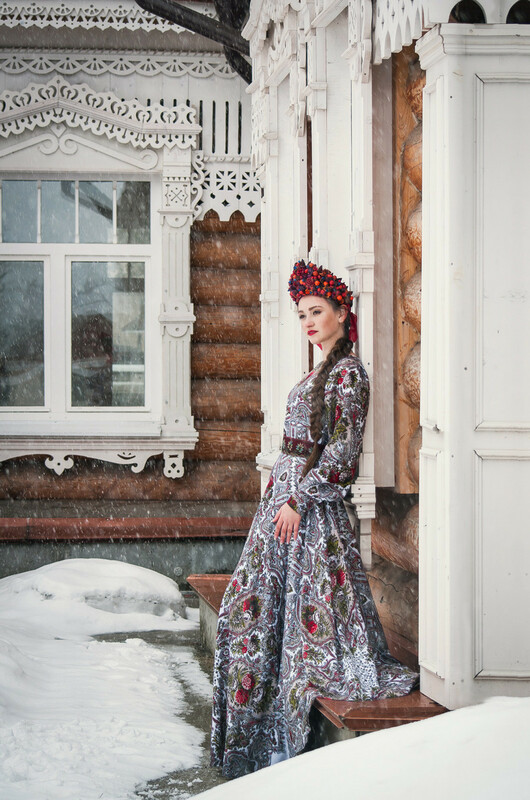 Peter the Great suppressed the boyars, members of Russia’s old aristocracy, forbade court ladies from wearing kokoshniki, and brought European-style décolleté (low-necked) dresses into the world of Russian fashion – a double whammy for married women. After that, the kokoshnik became more associated with merchants and peasants. 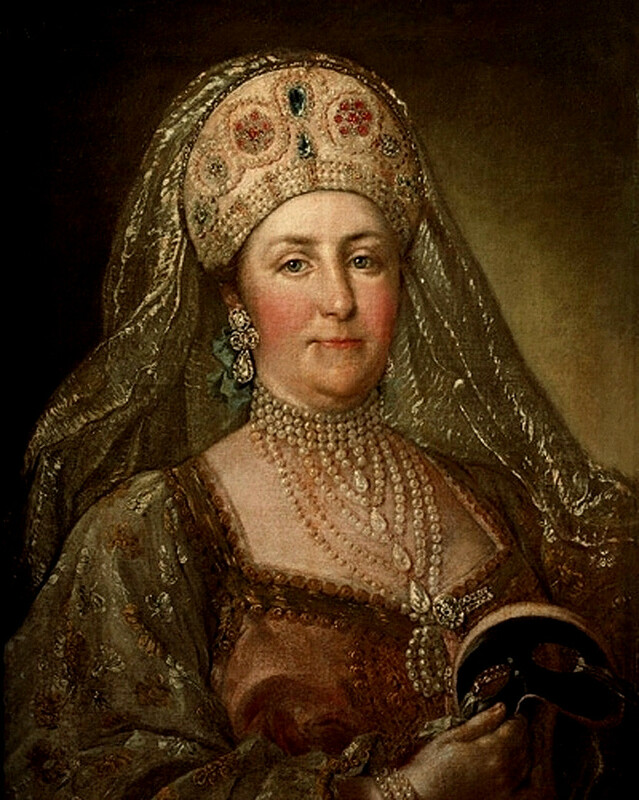 But the German-born Catherine the Great, wishing to emphasize her respect for Russian traditions, brought the kokoshnik back as an element of masquerade dress, and even sat for portraits wearing one. During the war with Napoleon in 1812, the once Francophile Russian high society returned to its roots, and throughout the 19th century portraits of court ladies and empresses in kokoshniks became fairly commonplace. In 1903, Nicholas II held a famous costume ball, celebrating the 290th anniversary of the House of Romanov. Members of the beau monde were fabulously attired in national Russian dress from the pre-Europeanization era, all richly decorated with jewels and expensive fabrics. 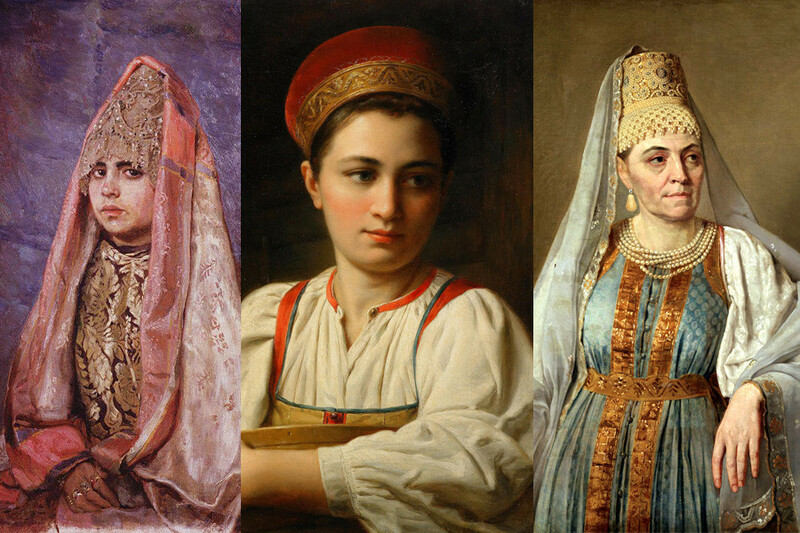 Ladies wore sarafans and kokoshniks. 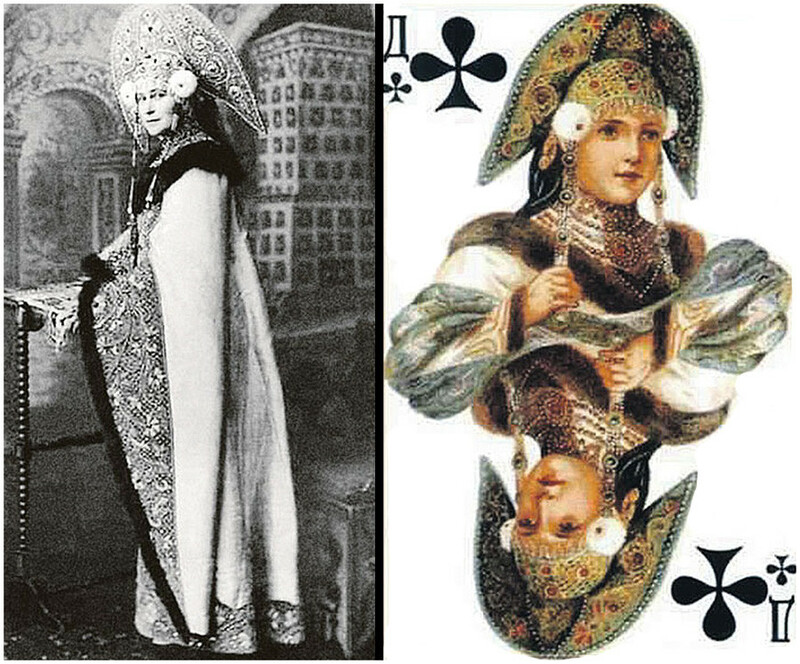 Numerous photographs were taken at the ball, and images of the magnificent costumes appeared on the back of Russky stil (“Russian style”) playing cards, issued in 1913. Nicholas II himself was the model for the King of Hearts. Incidentally, the Gold Travel Costume of Queen Amidala in Star Wars was also inspired by this imperial ball. With a helping hand from Russian émigrés and dancers, European brides were soon donning kokoshniks: Mary of Teck, the wife of Britain's George V, wore one at her wedding. 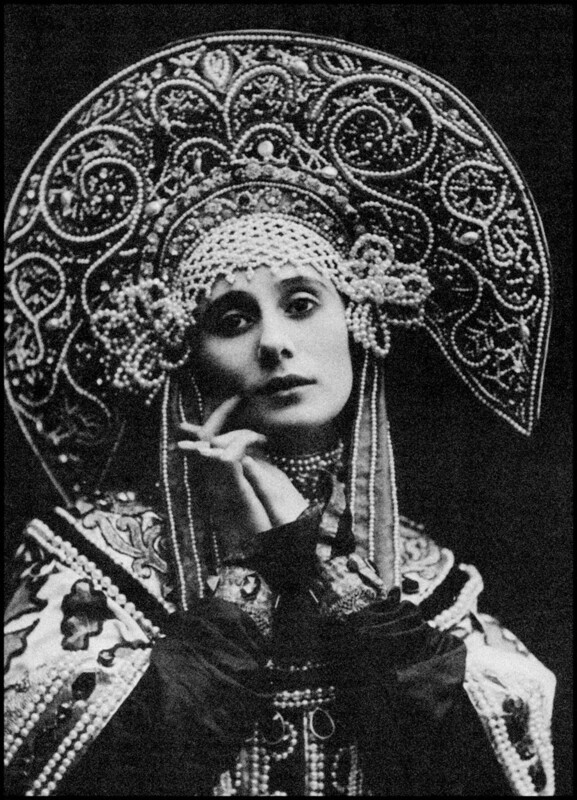 Ballerina Anna Pavlova danced in Diaghilev's “Russian Seasons” in a kokoshnik, and opera singers, actresses, and women of fashion are immortalized in photo chronicles of those years also sporting the iconic headdress. In the Chanel Paris-Moscou Pre-Fall 2009 collection, Karl Lagerfeld presented his interpretation of kokoshniks and matryoshkas. In 2011, Courtney Love performed in a kokoshnik at the Picnic Afisha music festival, and J.Lo appeared in a modern version of the traditional headpiece for the Russian version of Harper's Bazaar in 2014. It also attracts modern artists: Johann Nikadimus, for example, uses vintage materials to recreate kokoshniks from book illustrations by Ivan Bilibin and paintings by Viktor Vasnetsov.